Savvy Sheep: What Would Jesus Do? This week, I have been reading In His Steps, by Charles Monroe Sheldon, which I happened to find for free in a Kindle download a couple of months ago (it is now $0.99 again; well worth it). This happens to be the first time I've ever read the book, but I realize that it has in some small way shaped my whole life until this point. The central question, which directs all the characters in the book and all the radical changes they make in their lives, is "What Would Jesus Do?" They had previously gone through their daily routines doing what they thought was right, separating their daily working lives from their Christian, or church, living. Suddenly, that was no longer enough. I think the main point of Sheldon's work was to get Christians to think about what they are doing. That's a good goal. In fact, I think it's the chief aim of this blog. So, what do I mean when I say this book (which I've not finished yet) has shaped my whole life? Previously, I didn't know about the book, or that it had any connection to a bracelet I won in a Bible trivia contest at my grandparent's church. Remember the WWJD jewelry craze of the 90s? This was early in the movement, and I was a kid in junior high. Other kids would have chosen the candy out of the basket of prizes, but something made me pick up a little green ribbon bracelet instead. It wasn't even pretty, and even my family couldn't understand why it was important to me. Still, I chose the bracelet, and it changed my thinking. The popular thing, according to my peers, was to wear that WWJD bracelet at all times, so that's what I did. I wore it to bed, and saw it, first thing, when I woke up. I wore it to the grocery store and to school events. Pretty soon, it was so much a part of my routine that you could say it had become a part of me. To me, the letters on the bracelet summarized all of Scripture: love what God loves and hate what He hates, obey Him sacrificially in love, and stand (alone, if necessary) on His promise of salvation through His Son, Jesus Christ. I thought of the bracelet as a fulfillment (in my life, at least), of the words in Deuteronomy 11: 18 (NIV), "Fix these words of mine in your hearts and minds; tie them as symbols on your hands and bind them on your foreheads." What does the Bible say about choosing friends, or doing what your friends tell you to do? What does it say about academic conduct, or your shopping habits? What does it say about the words coming out of your mouth or the stuff you read and you watch? These are pretty deep questions for a kid in braces, but they did come up, at least in part because of the bracelet. My WWJD bracelet made me think, quite a bit, about what I was doing, and why. It prodded me to do a lot of searching in the Bible to try to answer that question, and when I found answers that showed I needed to change, I did. This radical decision to honor boundaries I felt God had laid out for me, rather than live with guilt, has caused me to lose a lot of friends and make a lot of enemies over the years. Maybe they just didn't understand why I made those choices, or maybe they just didn't agree. I'll never know. Maybe the WWJD bracelet is corny, but it was necessary to get my mind on this track. I don't regret it a bit. WWPD?--What would my parents do? Although I hope that your parents are modeling Christlike living for you, it's important to remember that they are fallible. Sometimes you discover a point on which you differ with your parents. If you do what is right, it might spur your parents toward a purer form of godliness, but on the other hand, it might not. This is about the way you live, not a new technique at manipulating others through your lifestyle. Jesus was in this situation Himself, but He didn't have a holier-than-thou attitude about it (Luke 2: 46-51). WWMAHD?--What would my academic hero do? Too often, children are taught that whatever the teacher (or later, the professor) says is golden, and should be followed without question. After all, this academic hero went to college and got a degree in it. Having gone to college and gotten a degree myself, now, I realize that much of what passes for superior knowledge is a collection of beliefs and opinions that change as new research emerges. Teachers aren't more righteous, or less fallible, than the rest of us (Matthew 5: 19-20). WWBB/BSD?--What would big brother/big sister do? It's a flattering thought (as a big sister), but often our older siblings are not much better than our peers when it comes to moral guidance. Sometimes they are the worst example we could choose (Genesis 25: 30-34). Better to cut out the middleman and just be honest with God, without excuses. WWRD?--What would reverend (pastor) do? The pastor, having spent a lot of time in the word, is trying really hard to do what Jesus would do (or so I hope). However, just like anyone else, he can get trapped in the minutia and lose sight of what is true. We hear about church scandals all the time. We can't base our faith and life on what the pastor does, although it may be a good starting point for the basics. Even the religious leaders can lead us wrong (Nehemiah 9: 33-35). WWMCD?--What would my countryman do? This is so close to WWW/MD? (What would my fellow man or woman do?) that I am not going to separate them. Every culture, and the two sexes within that culture, has a set of rules in which they operate. They have taboos (forbidden things) and also things they call acceptable, kind, or good. That doesn't mean they are drawing the line where God would. In fact, such cultural beliefs about righteousness are mostly made up by people who don't know God and actually reject Him. Be careful not to put cultural practices and standards in places where godliness would draw a tighter line (Jeremiah 2: 22; Luke 10: 25-37). Godliness is a higher standard that all cultures will be held to at the end. WWSSD?--What would Savvy Sheep do? I am adding this one in here, because I've recently become aware of a small following, and want to share the perspective of someone who is being "followed." Please, please don't make me the voice of your conscience. Your conscience will sound annoying enough when it makes you feel guilty about something you formerly loved to do, but if it sounds like your friend, you will probably lash out at this person without realizing what upset you in the first place (Proverbs 27:14). If you hear my voice in your head, correcting you all the time, I'll end up losing you as a friend, and that makes me sad. So, please, let's not fight! (1Corinthians 3: 5-7; 2 Timothy 2: 23-24). Well, that's my list, for now. Have you ever read In His Steps or owned some WWJD jewelry? How has it affected you? Did it push you towards something that made other people angry with you? I would love to read your comments! Really enjoyed this article. Do you still have the bracelet in the picture? If so I'd like to pulque chase it if you're willing to sell. 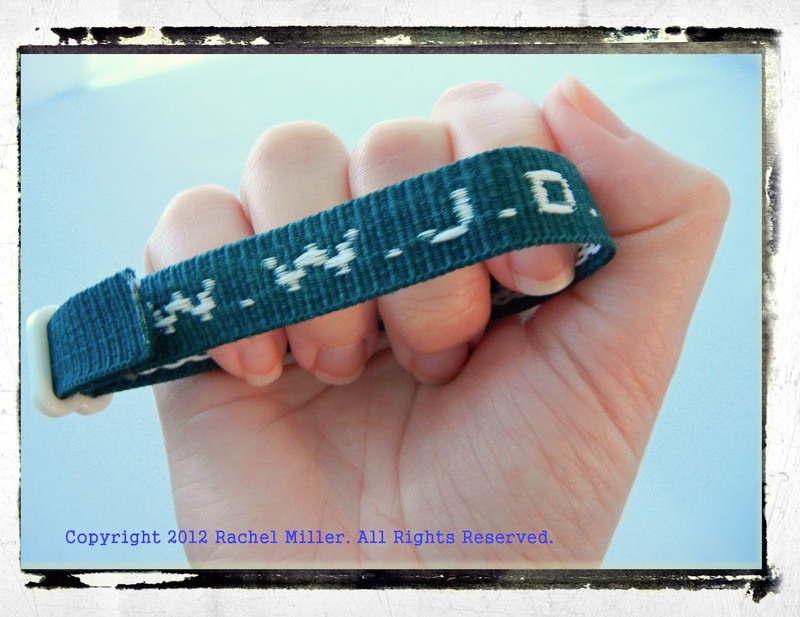 It's sad the wwjd bracelets aren't readily for sale anymore. It's such a simple reminder when you see it to live life differently.